Amazon drops price of the Kindle Fire HD 8.9 in the US, launches in the UK and Europe | What Hi-Fi? Amazon has cut the price of its new, larger 8.9in Kindle Fire HD in America from $299 to $269 for the wi-fi-only version, and $399 for the wi-fi and LTE model. At the same time it is releasing the bigger-screen tablet in Europe and Japan. In the UK, Amazon is charging £229 for the wi-fi 16GB model, and £259 for the 32GB one. 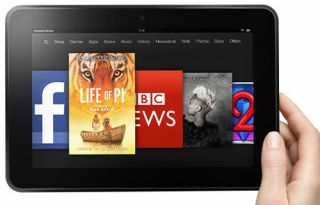 The basic Kindle Fire costs from £129, and the 7in Kindle Fire HD starts from £159. Amazon says the Kindle Fire HD 8.9 has "the highest resolution of any Kindle Fire", with a 1920 x 1200 display showing 254 ppi (pixels per inch) and capable of handling 1080p video content. Fast web browsing and video streaming is made possible thanks to dual-band, dual-antenna wi-fi. You can read our review of the 7in Kindle Fire HD, and 15 other tablets, in our special 16-page Ultimate Guide to Tablets in the April issue of the magazine, on sale now.